Ages 4 – 11 Summer and School Vacation Art Camps for Kids! Full Day and Half Day options are available! To Sign Up: Click on the dates below to register for that particular art camp. CREATIVE PAINTING, DRAWING, MIXED-MEDIA, & MORE! ART makes kids happy! See your child HAPPY THIS SUMMER at the best kids art camp in NYC! In New York City’s #1-Rated Art Studio, The Art Studio NY, our art camps for kids offer a safe, entertaining, educational and FUN art camp experience for kids of all ages and all artistic backgrounds, total beginners included. On NYC’s Upper West Side, our art camp for kids nurtures your child with creativity, inspiration, and encouragement. Our small-sized kids art camp classes average one art instructor to every five children, so your child will receive maximum attention and guidance. 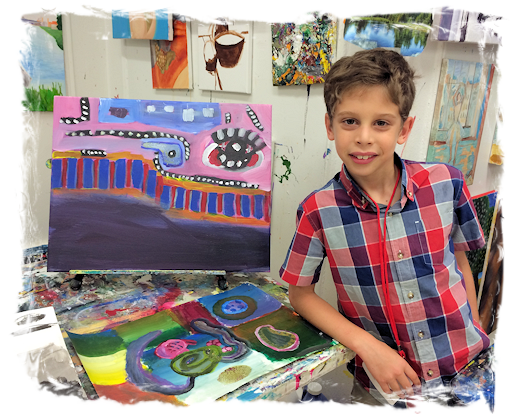 Every child receives one-on-one art instruction from our highly skilled, professional NYC artists who are passionate about YOUR child’s happiness. Check out our Kids Art Class and Teen Art Class calendars!